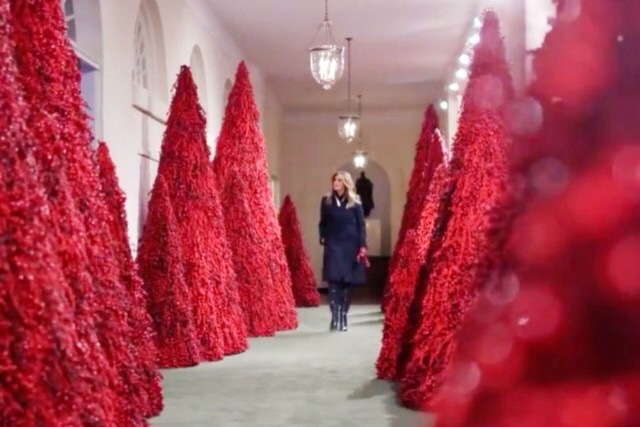 Care to promenade through the gauntlet of forty towering, blood red trees devoid of decoration? Perhaps we can hear them whisper, “Feed me, Seymour! Must be blood! Must be fresh!” The Internet has had a field day with memes and commentary. And as if resonating on the same wavelength, it bears mentioning that black Xmas trees are making inroads this year.- -Bring on Jack Skellington in his Santa suit! A comedy-horror series is a rare and wonderful thing, especially if it’s done well. 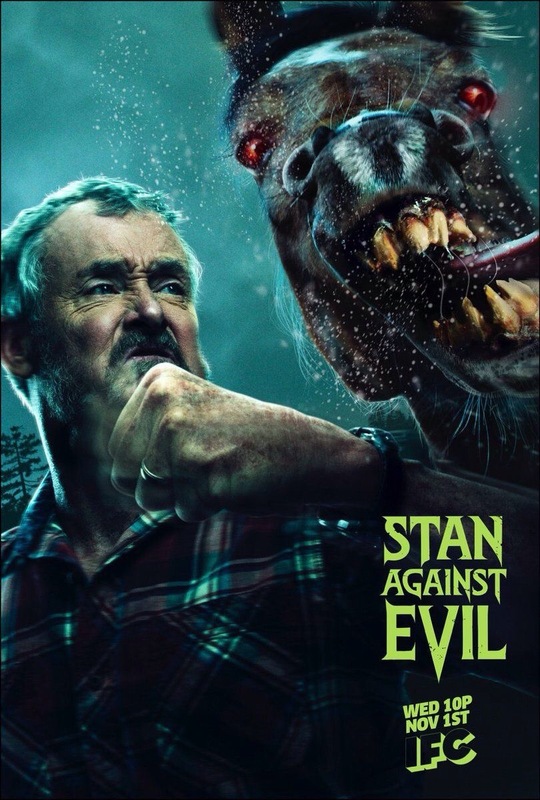 If you’ve missed this gem, you may want to check out Stan Against Evil, now in its third season on the IFC network. The show takes place in the fictional New Hampshire town of Willard’s Mill, which was the site of witch burnings in the late 17th century. As a result of that history, strange and creepy supernatural things continue to emerge there which are dealt with by the town’s former sheriff, Stan Miller (John C. McGinley) and it’s current one, Evie Barrett (Janet Varney). Now Stan Miller is a delight as an aging, cynical, slovenly antihero who just wants to be left alone, but can’t even manage to do that! Teamed reluctantly with the young and beautiful woman who is his successor, Stan is pressed into service to battle legions of demonic monsters that include witches, vampires, evil puppets, and even a were-pony! Although he’d much rather be drinking and watching television, Stan uses traditional and improvised weaponry to devastating effect, repeatedly bludgeoning for example a large winged skeleton-bird wraith creature (at right) with a shovel until it moves no more .- – You gotta love this guy! 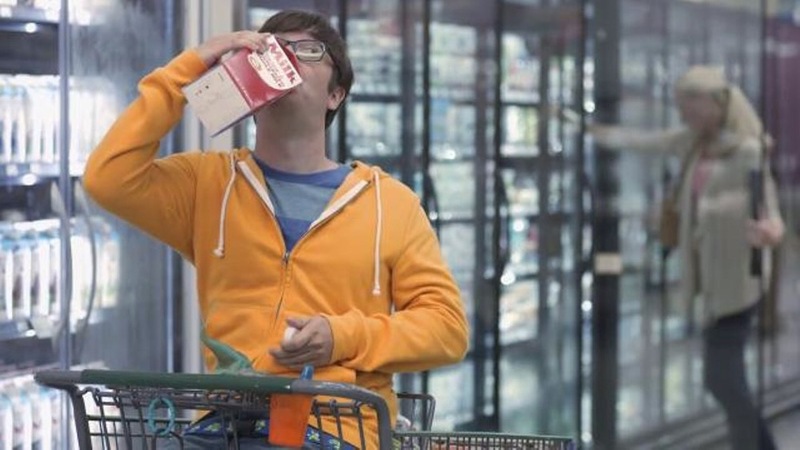 The show parodies horror in a loving fashion, and manages nods to The X-Files and other traditions from which it has drawn. I’m glad to see something like this still in active production…long may its demonic beasties thrive! Being a big fan of Halloween, I love images of early Thanksgiving parades because they had balloons and floats back then that were, well, creepy! Animals have had a long association with Thanksgiving Day parades since their inception, with the Macy’s Thanksgiving Day parade beginning in 1924 and including live animals, many of them actually borrowed from the Central Park Zoo for the occasion. The early Thanksgiving Day parades often had a circus orientation, and hence the animal elements. Actual lions, tigers, and bears were trucked down city streets, traumatizing them and causing the elicitation of roars and growls that frightened observing children. Wisely, the use of living animals was abandoned after a few years, with animal balloons and floats substituted, together with some great vintage cartoonish stuff that was rather surreal. Felix the Cat was an early parade favorite. In the 1930’s, Macy’s actually released their balloons at the end of the parade for a few years, with rewards of $25 offered for their return, a princely sum in depression-era America. Macy’s wasn’t the only Thanksgiving Day parade on the block, either, with Newark, New Jersey having memorable ones as well as other cities in diverse locations. I’m no stranger to Worry Monsters; we’re intimate associates, actually. It’s just that I never imagined them looking quite as they are depicted in commercials for POM Wonderful juices. Managing to look both disturbingly human and grotesquely cute at the same time, these monsters look like rejected prototypes from a Disney/Pixar movie, or perhaps toys for children that you hate. They’re covered in pastel-colored fur, have distorted or exaggerated facial features, and monster appendages like horns and pointy ears. There are scarier monsters in real life American politics, nudge-nudge, wink-wink! 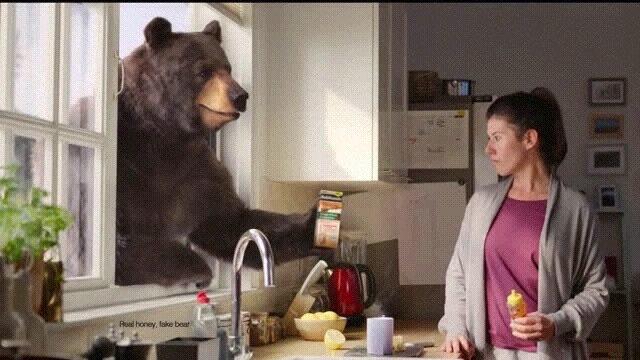 “Hi Susan!,” greets the anthropomorphic CGI bear cheerily as he rolls back a woman’s kitchen sink window in this Robitussin commercial. The woman has been coughing, and her cough is visible as a blue spray; drat, mine never is! 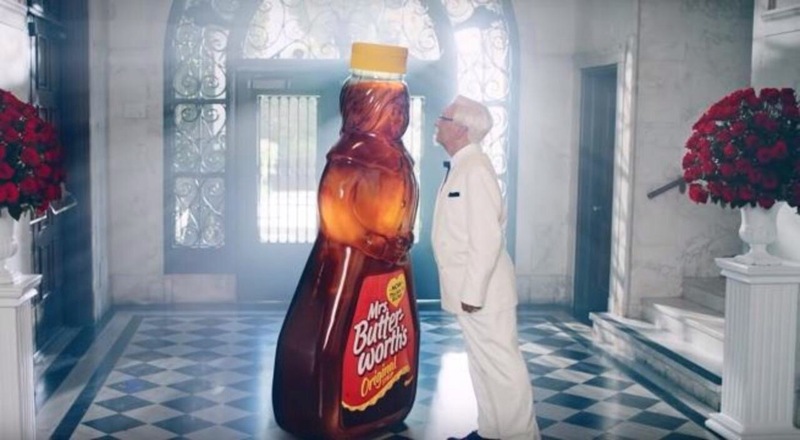 In her hand, the woman holds a honey container, appropriately enough one of those molded in the shape of a bear. She has been self-medicating her cough, you see, with honey, a popular home remedy for the ailment. …in my crazed mind, I would like to see a television series that unites a number of commercial animal spokes-creatures, including this bear, Maxwell the pig, and of course the Lactaide “milk that messes with you” cow. We’ll throw in Tony the Tiger, Toucan Sam, and other guest animals. It would be just the thing to heal us from the vicious political mid-term election attack ads now dunning us at every commercial interval. And this bear? – – better than your average politician, hey hey hey hey! – – I’d vote for him!